The Dramatic Vessel, Iwate Museum of Art, Morioka, Japan. Loewe Craft Prize 2018, Design Museum, London. Things of Beauty Growing: British Studio Ceramics, Fitzwilliam Museum , Cambridge. Masters of British Studio Pottery, Collect, Saatchi Gallery, London. Handheld, Aldrich Contemporary Art Museum, Connecticut. Timeless Secrets - Ceramic Artists in Their Own Words, Swindon Museum and Art. The Ehrlich Collection of American and British Ceramics, San Angelo Museum of Fine Arts, Texas. Things of Beauty Growing: British Studio Ceramics, Yale Center for British Art, New Haven, USA. The Dramatic Vessel, The Museum of Contemporary Ceramic Art, Shigaraki, Japan. Design Basel, Sokyo Gallery, Basel, Switzerland. Many a Slip, Marsden Woo Gallery, London. Vessels: The Spirit of Modern British Ceramics, Mashiko Museum of Ceramic Art, Japan. Toward a DESIGN MUSEUM JAPAN, 21_21 Design Sight, Tokyo. British Ceramics from Bernard Leach to New Generation, The Museum of Contemporary Ceramic Art, Shigaraki, Japan. Small is Beautiful, Frank Lloyd Gallery, Santa Monica, California. The Collector’s Exhibition, Liverpool Street Gallery, Sydney. 2nd International Ceramic Art Festival, Sasama, Japan. International Ceramics, Verkehr Museum, Shizuoka, Japan. From the World II , Gallery Hu, Nagoya, Japan. Classic & Contemporary, Erskine, Hall & Coe, London. LSG 2013, Liverpool Street Gallery, Sydney. Friendship Forged in Fire: British Ceramics in America. American Museum of Ceramic Art, Pomona, California. FIHOC part two, Frank's International House of Ceramics. Frank Lloyd Gallery, Los Angeles. Galerie Besson, Retrospective of a Lifelong Passion, Officine Saffi Ceramic Arts, Milan. the nature of things: Jennifer Lee, Hans Stofer and Laura Ellen Bacon, The New Art Centre, Roche Court Sculpture Park. Masterworks by International Artists, Yufuku Gallery, Tokyo. Contemporary Ceramics, Danese , New York. Contemporary British Studio Ceramics, Mint Museum of Craft & Design, North Carolina. Blue Chip, The Collector's Exhibition, Liverpool Street Gallery, Sydney. Group exhibition, Yufuku Gallery, Tokyo. U-Tsu-Wa, 21_21 Design Sight, The Miyake Issey Foundation, Tokyo. Contemporary Studio Ceramics: The Dauer Collection, California State University, Sacramento. The Cellmark Collection, Röhsska Museet, Göteborg. British Studio Pottery, Monnow Valley Arts Centre, Wales. British Studio Ceramics - 20th Century Transformations, Buckinghamshire County Museum. Twenty Years - Twenty Pots, Galerie Besson, London. Beautifully Crafted, National Glass Centre, Sunderland. Collect, Victoria & Albert Museum, London. Puur Klei, Pottenbakkers Museum, Tegelen, The Netherlands. International Post War Ceramic Art, Bonhams, London. Celebrating 30 Years, Crafts Council Shop at the V&A, Victoria & Albert Museum, London. Biennale Européenne de Céramiques Contemporaines, Mussée de l’Outil et de la Pensée Ouvrière, Troyes, France. 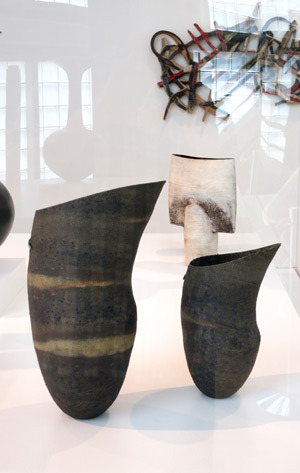 Modern Pots: Lucie Rie, Hans Coper and their Contemporaries, Dulwich Picture Gallery, London. A Duckworth Homage, Organic Abstraction, Garth Clark Gallery, New York. One Piece - One Artist, International Ausstellung, Galerie Marianne Heller, Heidelberg, Germany. European Ceramics, Westerwald Museum, Germany. Constructed Clay: Modern British Handbuilding, Galerie Besson, London. Selected British Ceramics, James Graham & Sons, New York. Ceramic Biennale 2003, Ichon World Ceramic Centre, Korea. British Ceramics: Five Artists, Frank Lloyd Gallery, Los Angeles. British Studio Ceramics, Buckinghamshire County Museum. Hove Museum & Art Gallery, Hove, Sussex. Vasen aus 10 Ländern, Bavarian Craft Council, Munich. Ceramic Modernism: Hans Coper, Lucie Rie and Their Legacy, The Gardiner Museum of Ceramic Art, Toronto. Poetics of Clay: An International Perspective, Philadelphia Art Alliance. 1st World Ceramic Biennale 2001, Ichon World Ceramic Centre, Korea. Modern Pots, Sainsbury Centre for Visual Arts, Norwich. Bengt Julin's Ceramics, Gustavsbergs Porslinsmuseum, Sweden. Britisk Keramik.2000.dk, Keramikmuseet Grimmerhus, Denmark. Color and Fire, Defining Moments in Studio Ceramics 1950-2000, Los Angeles County Museum of Art, Los Angeles (touring). Current Context - New Ways of Seeing, Royal Museum, Edinburgh. Clay into Art, The Metropolitan Museum of Art, New York. 25 Years of Contemporary Craft, Victoria & Albert Museum, London. Commemorative Mugs for the Millenium, Galerie Besson, London. Collecting Craft, Hove Museum & Art Gallery, Hove. Contemporary Decorative Arts, Sotheby's, London. Frauen in Europa, Galerie Marianne Heller, Sandhausen, Germany. English Craft, The Works Gallery, Philadelphia. European Ceramic Art II, Yufuku, Tokyo. Design im Wandel: Produkte, Fetische, Rituale, Übersee Museum of Anthropology and Ethnography, Bremen. Living Belsay, Belsay Hall, Northumberland. Collection: Los Angeles County Museum. Gift of Howard and Gwen Laurie Smits. Installation photo taken at LACMA in 2012.